A Disney cruise provides many ways for you to have fun and make memories with your family – including the time spent in your stateroom! Not only is it the place to rest and recharge between exciting experiences at port and at sea, but it’s also the special place where begin and end of each day. 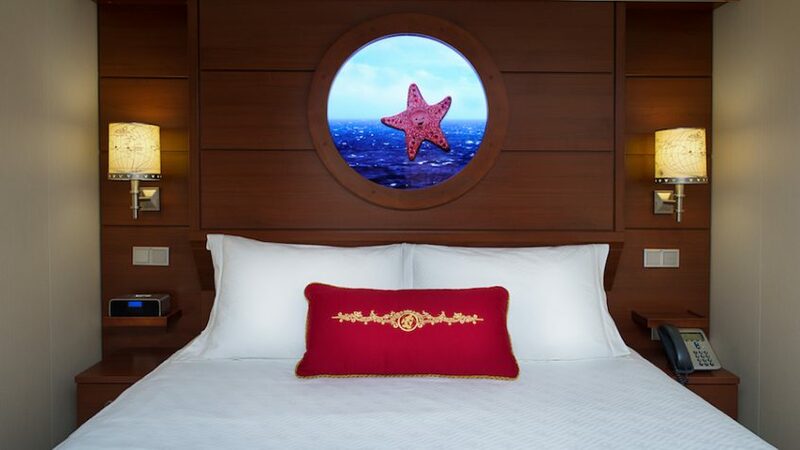 Did you know that Disney Imagineers designed the staterooms specifically with families in mind? That means every feature is tailored to your needs, from spacious settings to top-of-the-line amenities … and of course, whimsical Disney touches thrown in just for fun! The staterooms were expertly designed for maximum convenience and comfort, with unique features like elevated beds (with plenty of storage space beneath) and plenty of connecting doors for larger parties. Plus, pixie-dusted details throughout the room add touches of Disney magic to your stay… like celestial views of Peter Pan soaring overhead from your pull-down bed! Even the bathrooms were thoughtfully designed! Disney introduced its signature bath-and-a-half concept to the cruise industry to make getting ready more convenient for families. While one room includes a vanity, sink and full tub/shower, the “half” bath has a vanity, sink and toilet. And many staterooms feature round tubs with a built-in seat, a rain shower head and a hand-held shower – perfect for giving children a bath! The majority of Disney Cruise Line staterooms feature verandahs or oversized portholes, but Disney Imagineers took things a step further aboard the Disney Dream and Disney Fantasy, where even the inside staterooms offer a (virtual) window to the world. These industry-first Magical Portholes provide a real-time look “outside”… plus an occasional visit by Disney character friends! Breakfast in bed, afternoon nosh or midnight snack – cravings can be satisfied any time of day with 24-hour complimentary room service on all Disney cruise ships. Pro Tip: Remember that movie night we were just talking about? Add an order of milk and cookies!